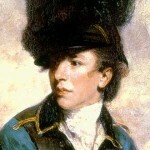 Sir Banastre Tarleton (1754-1833) was a British cavalry officer who served in the Revolutionary War and acquired a reputation for ruthlessness and brutality. Tarleton was born in Liverpool, the son of a successful merchant who had profited from American colonial trade. As a teenager, Tarleton inherited a large sum after the death of his father but wasted most of it on gambling. Without means to establish himself in business, he abandoned his law studies and purchased a commission in the Dragoons (cavalry). Tarleton found military life to his liking and demonstrated skill both as a horseman and a soldier. He volunteered to serve in North America, arriving there at the beginning of 1776. In his first year, Tarleton served under generals Clinton and Howe and excelled as an officer, earning a promotion to lieutenant colonel. In 1780 Tarleton was deployed to the south and given command of the British Legion, a combined cavalry and infantry force comprised chiefly of American Loyalists. 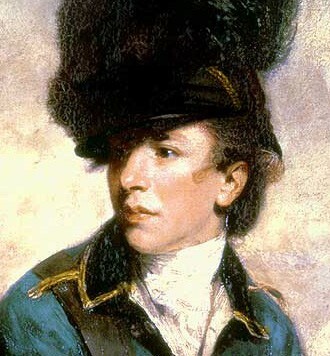 Tarleton’s exploits in the southern campaign earned him a reputation as a gifted and fearless, though impulsive and sometimes reckless commander. He was both feared and loathed by American ‘Patriots’, who referred to him as “Bloody Tarleton”. This reputation stemmed mainly from an incident at Waxhaws, South Carolina, in May 1780. Ordered to sweep the backcountry around Charleston, Tarleton’s cavalry engaged an inexperienced regiment of Continentals and demanded their surrender. When this was not received, Tarleton’s men continued their attack, despite the raising of a white flag of surrender. According to some reports, dozens of Continental soldiers were slaughtered after surrendering or being captured. The extent to which Tarleton himself was responsible for this massacre is unclear. In August 1780 Tarleton and his men contributed to the British victory in the Battle of Camden. They were later defeated at the Battle of Cowpens (January 1781). Tarleton returned to Britain in late 1781 and wrote a history of the Revolutionary War, which was largely a justification of his own service. In 1790 Tarleton was elected to parliament, where he served for 21 years. As a politician, he supported the continuation of the slave trade, mainly because his own brothers were profiting from it. He died childless in 1833. Tarleton’s service in the Revolutionary War was the inspiration for the murderous Colonel Tavington (Jason Isaacs) in the 2000 film The Patriot.